Grilling makes everything better. I’m pretty convinced that this is true, and so far I haven’t been challenged on it. 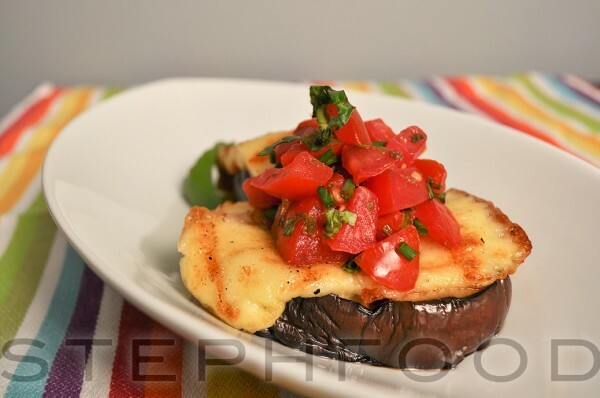 Eggplant is one of the easiest things to grill up – it gets tender inside, and full of flavour. I was inspired by the caprese salad stacks I often make in the summer, and decided to come up with a grilled version that featured eggplant. My introduction to Haloumi made the cheese selection simple. It was a revelation! The cheese melts just a little, and even gets the grill marks, but it doesn’t start to get oozy. You just put it straight on the grill and watch the magic happen. I tried a few different brands that were all delicious, but my favourite came from nearby Upper Canada Cheese Company. Their Guernsey Girl grillable cheese is delicious and salty, and just a little squeaky. While the cheese and the eggplant are amazing on their own, I felt they needed something to pull the dish together. I made a topping with diced tomatoes mixed with fresh chopped basil. It’s important to make this a couple of hours before you want to eat, to give the mixture some time to be totally infused with basil. I made this dish at least a dozen times this summer, and as a result ate waay too much cheese for my own good. Yay! It’s best to choose an eggplant that is longer, rather than wider, with a fairly consistent diameter. This ensures your stacks are roughly the same size. Mix the tomatoes with the basil, salt and pepper in a medium-sized bowl. Set aside. If your tomatoes are too watery (even after seeding), you may need to strain this mixture later on to remove the liquid. *Lightly* brush both sides of the eggplant slices with olive oil while the grill is preheating. 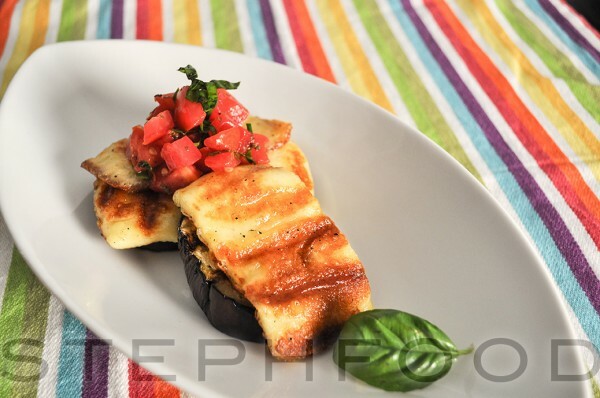 Grill the eggplant rounds until tender, and grill the haloumi slices until softened and lightly browned on the outside. The haloumi will not melt entirely. 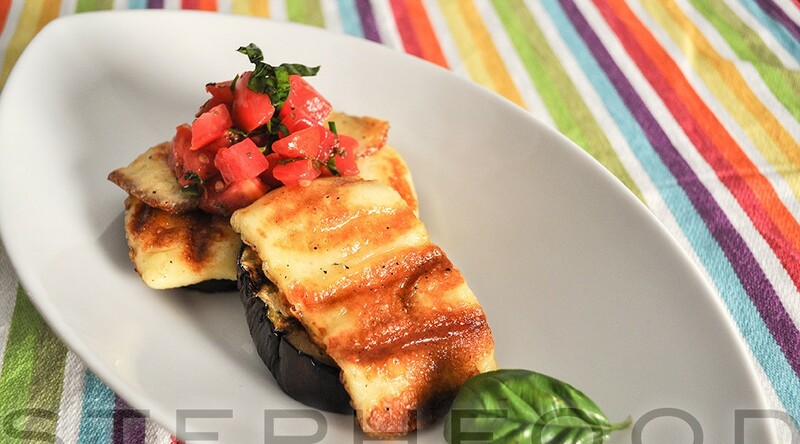 Stack the ingredients as follows: eggplant round, haloumi slice, a teaspoon of the tomato mixture.